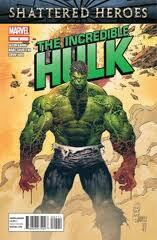 The last time I read a Hulk title was during the World War Hulk era by Greg Pak and John Romita, Jr., which was awesome. I'm aware that I'm behind on numerous character and plot developments. Perhaps the biggest development, other than the Red Hulk, is the fact that Banner and Hulk have been separated. I had to do some research and found out that the two were separated by the Hulk somehow during the Fear Itself run, which I missed. I'll need to see how that happened and I'm afraid it will be one of those classic WTF Marvel moments where science and/or reason is thrown out the window. I've enjoyed the work of Jason Aaron and Marc Silvestri in the past, so I thought they would have a nice run with The Incredible Hulk. After reading the first issue, I was pleased with the direction of the story. Now, I will say that while the first issue was pretty good, it was by no means something totally new or groundbreaking for Hulk fans. Let's start from the beginning of this issue. I was under the impression that the Hulk was back on Sakaar for some reason, but I soon found out that he was with the mole people. As someone who has been an off-again-on-again reader of the Hulk, it would make sense to have this guy somewhere else than on Earth or below the surface of the planet. The Hulk is too dangerous to be on this planet (see Planet Hulk and World War Hulk) so perhaps a nice distant planet where things are not as chaotic as Earth would be nice. Can Dr. Strange locate a planet that's like the Bahamas? As we see the Hulk among the mole people, we are treated to some sort of human invasion where a lady named Amanda Von Doom (no relation) seeks the Hulk's assistance in dealing with Bruce Banner. What's going on with Banner? Well, we find out that he's lost his marbles and has developed an island of genetically altered animal misfits. Could this be the Island of Dr. Moreau? Maybe, but he does have a couple of wild boar henchmen collecting animals for "research". Also his henchmen may have learned the Queen's English from the Jar-Jar Binks School of English as a Second Language. Finally, we see the deranged Banner, sweating profusely, trying to create another Hulk. This first issue was good enough for me to check out the next issue. As I mentioned earlier, I see nothing overly groundbreaking or fresh with the plot of this story. The exiled Hulk is nothing new. The military seeking the assistance of the Hulk is not new to me and it was odd in my opinion because I would be under the impression that they want to avoid that guy like the plague. Maybe they could send out the Avengers or SHIELD? Banner as the evil but nutty mad scientist is a new twist and I hope and pray they do not end up with some goofball ending where some poorly devised Marvel "magic" brings the two back together. I have faith in Jason Aaron as the writer of this series, so I'm hoping for a solid run. Silvestri fans will not be disappointed by his artwork. The guy hasn't lost his touch, so there is really nothing more I can say at this point. Of course his style fits perfectly with the story. I will check out the second issue of this story and will do my best to give this entire run a chance.